"But I would share with the families how (the addicts) had changed for the better. If they didn't believe, they could visit them and see." The housewife, affectionately known as Shao Hua Jie (Sister Shao Hua) to residents at the halfway house in Yew Siang Road, has helped to reconcile more than 200 former drug addicts with their families. But the elderly woman with a small build and genial smile has also been on the receiving end of less-than-friendly welcomes. Once, she stood outside a former drug abuser's home for an hour because the family, disappointed with his actions, refused to let her in. But even those with hardened hearts have relented after her persistence and invited her for chats in their homes. She ended up sharing meals with many of the families. "Deep down, these families want to know how their sons are coping, and if they will ever change," said the soft-spoken Madam Khaw. The devout Christian believes God has given her "this burden" to persuade families to accept the recovering drug abusers. "I want to show God's love for others, especially those who need a second chance," she said. "I see these brothers grow, I see them change. If we don't give them a chance, we won't know whether they will mend their ways." Pastor Simon Neo, 66, a former drug addict who started Breakthrough Missions, said mending strained relationships is tough work. "Many of our residents come from broken families, who may find it hard to accept them again after what they have done. It takes a lot of effort to rebuild those ties," he said. But that has not stopped Madam Khaw, as well as other volunteers who visit the families' homes in groups. Madam Khaw, who uses public transport to visit the homes, has made countless trips to show concern for the families on behalf of the halfway house's residents. Such visits can stretch to three hours or more each. She has lost her way at times and tripped and fallen on a couple of occasions en route to seeing the families, said Mr Neo. "She doesn't get tired and sometimes she would even visit them without telling us. She reassures the families, so that they are ready when their sons come home." Madam Khaw was born to a well-to-do family in Fujian province in China. When she was five, her gold trader father and housewife mother brought her and her two younger brothers to Singapore. She had the privilege of learning the piano from a young age and attended school till Secondary 2, when the Japanese Occupation began. At the age of 18, she married a businessman and the family continually shuttled between Singapore and Indonesia because of his business ventures. Her husband died about 20 years ago. Madam Khaw, who has five children and six grandchildren, now gets by on her savings. Her children, most of whom are residing overseas, are happy for her as she is doing something meaningful even at her age. But she has had to cut back on home visits after falling a month ago. 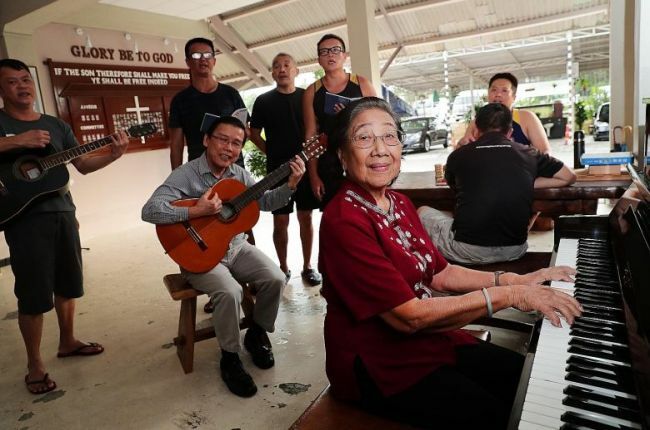 Instead of shuttling back and forth from her Telok Blangah flat, she is now staying at the halfway house, which has set aside a room for her so that she can be looked after by the residents and staff. She now spends her days helping out at Breakthrough Missions, such as teaching its residents how to write Chinese characters. She also keeps in contact with those who have left the halfway house, and helps find jobs for those who are unemployed. "I care about them and I want to see that they are doing well," she said. Many former residents whom she has helped have since done well. Some have reunited with their families, while others have got married and started their own families. Among them is Mr Aaron Xie, 35, who was in and out of prison eight times for various offences, including drug consumption. He was placed on a rehabilitation programme at the halfway house during his last jail term five years ago. But he returned to his old ways shortly after completing the programme, prompting Madam Khaw to visit him one morning. "That was the first and last time she visited my home. I felt bad that she had to travel all the way to find me," he said. "She told me not to waste my time leading such a life. If she hadn't visited me that day, I don't know what would have happened to me." Madam Khaw later convinced him to return to the halfway house, where he could be around supportive friends and kick his old habits. Today, Mr Xie is an employee at the halfway house, where he helps other drug addicts to reform. "Many people wouldn't even bother to care about drug addicts. For a stranger like her to show such love is rare," he said. "She is like a mother to us. Even though she doesn't get anything in return, she never gives up on us."